You would assume that here in the north hemisphere, your solar panels should be facing south, where the can enjoy the most sun exposure, right? Wrong. A new study, they actually do better when pointed west because peak demand on the power grid is in the afternoon and evening, and so getting more solar power during that period is actually more useful at reducing the need for polluting sources of energy. In short: To get maximum benefits, it's not just about how much electricity is produced, but also when it is produced. 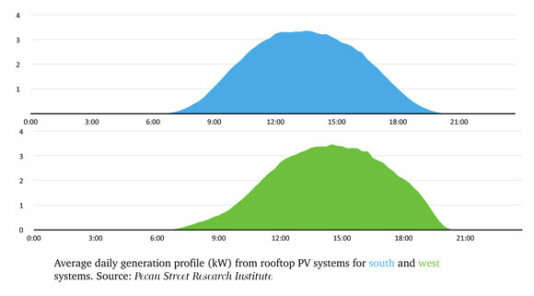 The Pecan Street Research Institute study shows that west-facing panels, compared to south-facing ones, produce 49% more electricity during peak demand time. Notice above how the production curves are similar, but one is shifted slightly to the right. That makes a big difference because peak demand is in that direction (everybody comes home at the same time and turns on the lights, electronics, appliances, uses hot water, etc.). “The Pecan Street Research Institute found that homeowners who aimed their panels toward the west, instead of the south, generated 2% more electricity over the course of a day. More importantly, those west-facing panels reduced household electricity usage during the times when electricity is most expensive—and power grids are most likely to become overloaded—by 65%, while south-facing panels only reduced usage during those times by 54%. In Texas, as in most places, those “peak times” are from 3pm to 7pm, and correspond with the heat of the day”. This would make an especially big difference where there are time-of-use electricity rates that go up during peak time. If you're going to produce clean electricity from the sun, you might as well do it when it will displace as much expensive electricity from the dirty grid. Incentives for solar should be aligned so that production follows peak demand as best as possible, which isn't the case right now, especially where they don't vary electricity prices for peak and off-peak periods.